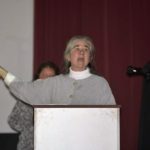 A groundswell of opposition is developing to building a logistics center on a 120-acre farm in rural Tilden Township.On Tuesday night, a standing-room-only crowd packed the historic 185-seat Hamburg Strand movie theater to hear a litany of reasons why the township supervisors should not enact a Logistics Park Overlay District. Organized by Residents Against Warehouse, or RAW, the town meeting lasted for more than two hours. Tracey Readinger, one of the organizers, said a group of about 15 to 20 opponents of a warehouse on the property of Philip Werley spearheaded the opposition movement. “We want to know if the economic impact is worth the loss of our quality of life,” said Readinger, who would be able to see the warehouse from her home on Laurel Avenue.The opposition movement comes as the Tilden Township supervisors are faced with making a decision on the proposed overlay district, which would rezone part of a residential district to allow for the construction of a logistics center. The supervisors have yet to make a decision on an ordinance that would establish the overlay district. The issue will be discussed at a workshop meeting Friday at 9 a.m. in the township building. None of the estimated 200 people at the meeting spoke in favor of rezoning the Werley tract to accommodate a warehouse. Century Land Development Co. of Sinking Spring has indicated plans to construct a 1.2-million-square-foot, 55-foot-tall logistics center in the overlay district. The center would process about a tractor-trailer a minute during limited hours of operation. Trucks would enter it from Route 61, through Tilden Ridge shopping center and a portion of Mountain Road. Pine Road, where the Werley farm lies, would be reconfigured to handle truck traffic. Aided by slides on the theater’s screen, Readinger outlined a host of issues ranging from the volume of truck traffic to air, light and noise pollution. A six-page flyer distributed at the meeting also raised concerns about declining property values of homes near the logistics center, and questioned the accuracy of the estimated $375,000 a year in tax revenue the facility would produce. Readinger announced that RAW is considering hiring a lawyer as a consultant. Following the meeting, many who attended made donations to a legal fund. The group is also seeking nonprofit status so donations can be tax deductible. Marc and Dodie Sable, the driving force behind the opposition to the proposed Crossroads X warehouse in Greenwich Township, offered advice to the group. On Monday, facing an outpouring of opposition, Greenwich Township supervisors rejected a preliminary plan submitted by the Crossroads X developer. Barry Shollenberger, a RAW organizer, urged residents to attend Friday’s workshop meeting and the upcoming monthly supervisors meeting Dec. 13 at 7 p.m. in the township building. Some in attendance suggested that the meeting be moved to a larger facility. Richard DeLong, a supervisor-elect who will take office in January, said he opposes a warehouse at the site in question. Residents who attended the meeting signed a petition opposing a warehouse and expressed their opposition on questionnaires circulated by the township. RAW will deliver the responses to the township building today. Readinger urged residents to keep the pressure on the supervisors.